Amber Rudd says the increased use of food banks is partly down to problems in rolling out universal credit. 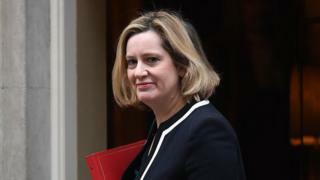 The work and pensions secretary said she was "absolutely clear there were challenges with the initial roll-out" of the benefit and that the difficulty in accessing money was "one of the causes" of the rise.But she said the government had made changes to help tackle food insecurity. Universal credit has been plagued with problems since its inception in 2010.The monthly payment merges six different benefits for working age people into one and has been subject to a gradual roll-out across the UK. The system was supposed to be up and running by April 2017, but it has faced numerous delays and is now not expected to be fully operational until December 2023.Research released by the Trussell Trust charity this month showed the use of food banks had increased by 52% in areas where universal credit had been in place for a year or more - compared with 13% in areas where it had not been. Speaking in the Commons, Ms Rudd said the government was "committed to a strong safety net where people need it". "It is absolutely clear that there were challenges with the initial roll-out of universal credit," she added. "The main issue which led to an increase in food bank use could have been the fact that people had difficulty accessing their money early enough. "We have made changes to accessing universal credit so that people can have advances, so that there is a legacy run-on after two weeks of housing benefit, and we believe that will help with food and security. "Pushed again on the cause of the issue by Labour's Stephen Timms, Ms Rudd added: "I have acknowledged that people having difficulty accessing the money on time as one of the causes of the growth in food banks, but we have tried to address that." The Department for Work and Pensions has said that, under universal credit, people are moving into work faster and staying in work longer.According to the Resolution Foundation think tank, 2.2 million families are expected to gain under the system, with an average increase in income of ?41 a week.However, 3.2 million families are also expected to be worse off, with an average loss of ?48 a week.Labour has called for ministers to halt the roll-out "as a matter of urgency".